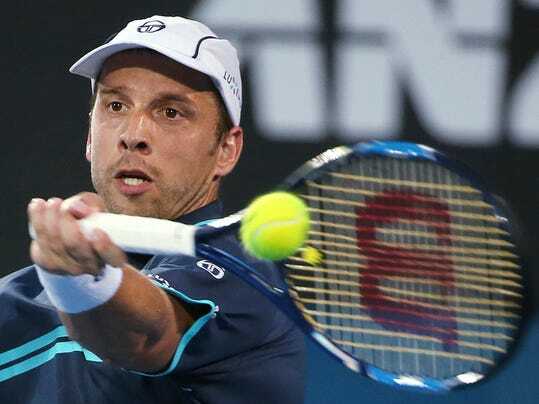 SYDNEY (AP) — Luxembourg veteran Gilles Muller prevented an all-Britain singles sweep at the Sydney International, beating Daniel Evans 7-6 (5), 6-2 in the men’s final Saturday. It was the 33-year-old Muller’s first ATP win in his sixth final. At No. 34, he had been the highest-ranked player on the ATP Tour to have not won a tournament. Sydney-born Johanna Konta of Britain won the women’s final on Friday over Agnieszka Radwanska. Muller had played 16 years and more than 260 matches to achieve his first tournament win. He broke down during the trophy presentation ceremony. Muller won $78,000 and a rankings boost that will lift him into the top 30 for the first time. He has a first-round Australian Open match against American Taylor Fritz.